Since the wider a ring is, the tighter ring sizer of the same width as the rings of your choice. 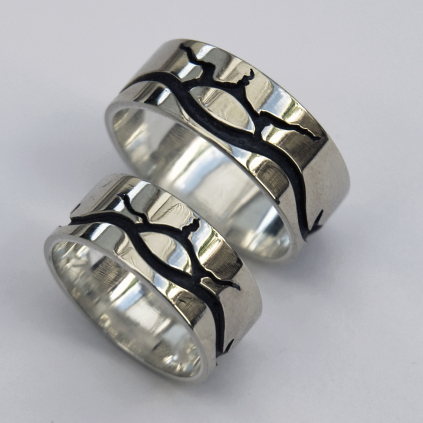 The contrasting black-and-white colors of these wedding rings, the minimalistic design in combination with the stylized and oxidized outlines of the sun and the waves of the lake, conjure up images and stories of BIBOON the winter spirit who, with his annual freezy breath, keeps the lakes and rivers of the northwoods in his icy grip. However, besides a time of cold, disease and scarcity, winter season is also symbolic of inner warmth and positive values like resourcefulness, self-reflection, and mutual protection. 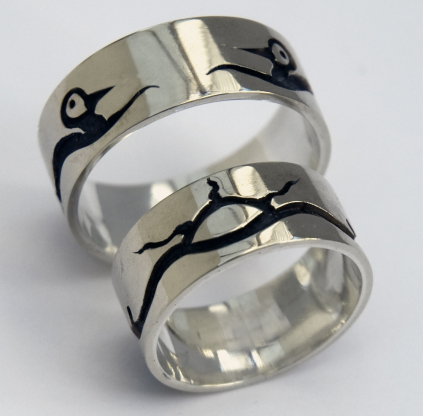 The waterfowl designs at the back of the wedding rings, which I depicted as mirror images of each other, are stylized representations of Zhingibis the grebe, a beloved character in many aadizookaanan (sacred stories) that Ojibwe grandparents tell their grandchildren in the long winter moons. This aadizookaan, which is known to non-Natives as “The Legend of Shingebis and the Wintermaker” (why Euro-Americans persist in calling these stories 'legends' I do not know), is a metaphorical tale about a brave and very resourceful grebe (you know, those hell divers who dive like lightning and make these funny "WUP-PUP-PUP-PUP-pup-pup-pup-caow-caow-caow-caow” sound), who bravely withstands the fury of Giiwedin, the Spirit of the Northwind. "Once upon a time Zhingibis lived in a lodge by a lake and went about his daily life during the winter moons. Giiwedin noticed that the small bird was unaffected by the his icy breath, and did everything in his power to defeat him. When nothing worked, Giiwedin eventually admitted defeat, and praised the strength of Zhingibis, the resilient little grebe who could not be frozen or starved. Meanwhile Zhingibis did not acknowledge the Northwind as his enemy, but simply a fellow creature who could not harm him..."
The moral of the story – follow the path of Zhingibis and you will always be warm and have plenty of food during the cold season - is also a metaphor exemplifying mental strength and the virtue of perseverance and fortitude. In the context of these wedding rings, it means that couples must always take good care of each other, protect each other (“keep each other warm”) and keep focused so that they are able to withstand together the challenges and adversities they encounter, and in the end will walk with their heads up tall and their eyes clear. Such is the sacred story of these wedding rings.